This project is about human interaction — how we choose to treat other people. (Thanks to Janice Jow, who suggested writing down and sharing the stories from The Love Bead Pin Project). 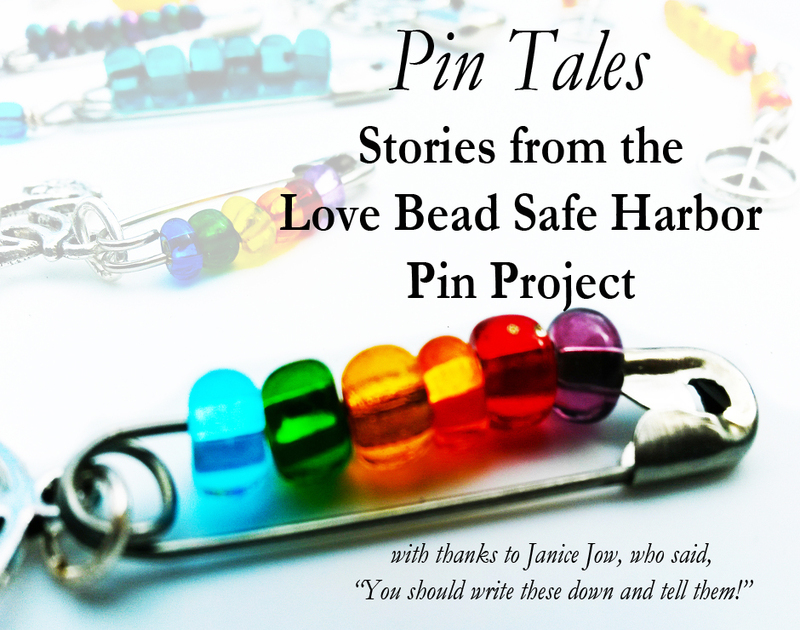 After a few months of handing out Love Bead Safe Harbor Pins informally, just carrying a few with me and handing them out whenever someone admired the pin I was wearing, I had worked out a system. By then I had started slipping the card into a cellophane sleeve, thinking that I wanted to make it clear that this hand-beaded pin was a little gift, that thought and effort had gone into its creation. Most were single pins, one on a card. I decided to step it up and make 125 pins. It took quite a while. They’re not something you can just crank out. It’s actually pretty tough on the hands to make a lot of them. But I picked a local event, made 125 pins and bagged them up. A few were smaller, and more simple (a plain pin with a pendant), and I put those on cards in pairs, but the fancier ones were singles. Mark drove me to the event because parking was hard to find and I needed him to drop me off (when you’re on crutches, as I usually am, distance is an issue). I got out with my big sling bag of pins. I didn’t know how long I would be, I reminded him. It might be hard and take time to give away 125 pins. It took 15 minutes. A group of young women looked through the pins, holding them up and discussing which pin would look best on which person, “You always wear pastels, so this one would look good. Hold it up to your shirt…” One young woman watched as her friends sorted through the pins and debated. She reached in and picked a package of two pins, each just a pin with a small pendant. “No,” her friends told her, “not that! Here, this one is prettier…” The held up other choices, single pins, more elaborate. In an instant, she had a major impact on this project. A light went on in my head. “That’s how it should be,” I thought. 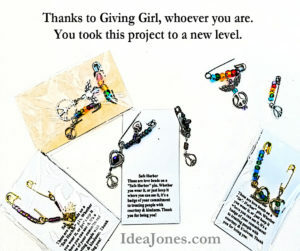 “There should be one pin to keep and one to share with someone else.” It makes giving an integral part of the project. It turns the person who shares that pin into an ambassador for the ideas behind Safe Harbor. It makes each pin even more truly Love Beads. Because of her, there will always be two pins on a card. One to keep, one to share. So she is a part of every set of pins we give away. This entry was posted in Art, IdeaJones, Jewelry, Love Bead Safe Harbor Pin Project and tagged #lovebeads, #lovebeadsafeharbor, #pins, #pintales, #randomactsofart, #safeharbor, #safeharborlovebeads, #summeroflove, 1960s, 60s, IdeaJones, Joey, love bead, love bead safe harbor, love bead safe harbor pin, love bead safe harbor pins, pin tales, random acts of art, safe harbor, safe harbor love beads, summer of love. Bookmark the permalink.